Mario Fabrio spent a year building this massive oil rig that rises over 5 feet tall. 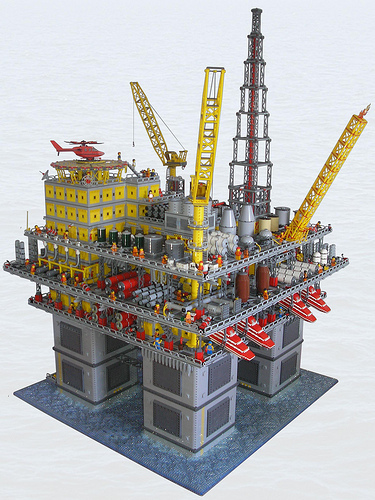 According to the builder, the model is not based on an existing oil rig but contains just about all the components of a real one. Check out more photos on MOCpages. Mario, This thing is a delight! The detail shots really capture the amount of detail… it’s endless. But for me, the water is the real eye catcher. The color, the “shape” of it. Cool! Incredible, I think my young mind would have exploded if I had access to something like this as a kid. Well done Mario.